Discovering a career in support services where the opportunities, challenges and rewards match your desire to make a difference — This is Real! Seek joy with us here at JPS Health Network and own it like nowhere else. 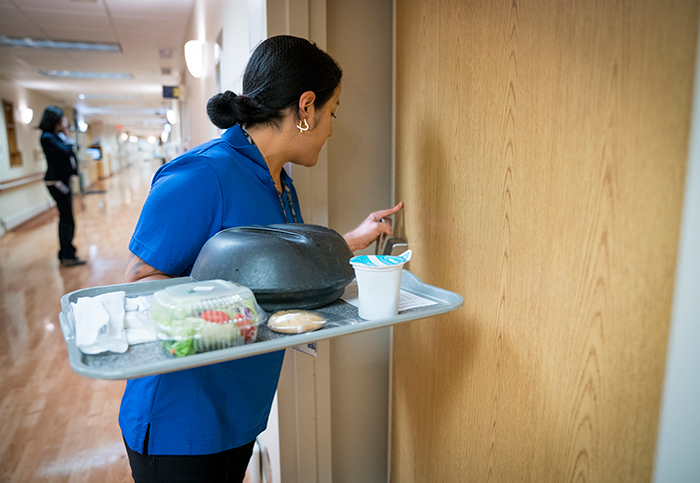 Supervises assigned staff in the performance of work required to provide meal services to patients and cafeteria customers. Trains, schedules, counsels, and evaluates foodservice workers in their job responsibilities. Ensures equipment usage by staff and monitors equipment for proper operations. Ensures that sanitation and cleaning procedures are followed in food preparation and service areas. Monitors patient trays for accuracy; responds to and mediates patient or customer concerns/complaints regarding meal services. Recommends and implements change to improve the effectiveness, productivity and efficiency of department operations. Completes assigned reporting responsibilities (cash transactions, audits, customer satisfaction, quality and process improvement). Maintains knowledge of applicable rules, regulations, and policies that impact Nutritional Services. Develops and monitors internal controls that promote adherence to applicable City, State/Federal laws and program requirements of accreditation agencies. Stays abreast of current developments in foodservices, participates in leadership training activities, and actively participates and leads employees in hospital training initiatives for employees. 1 year experience in a related position. Will substitute internship/education for experience. Associate or Bachelor’s Degree in foodservice management, nutrition or dietetics related field. City of Fort Worth Food Handler certification or State of Texas Food Manager’s Certification. JPS Health Network is a $950 million, tax-supported health care system for Tarrant County in North Texas. Licensed for 578 beds, the network includes an acute care hospital and more than 40 community-based clinics, including 19 school-based clinics. John Peter Smith Hospital is home to Tarrant County’s first and only Level 1 Trauma Center, its only psychiatric emergency services site and has the largest hospital-based family medicine residency program in the nation. Our network employs more than 6,500 people. outcomes of the network. Our goal is to provide high quality, compassionate clinical care for every patient, every time. For more information, visit www.jpshealthnet.org . To view all job vacancies, visit www.jobs.jpshealthnet.org/ or www.teamacclaim.org .